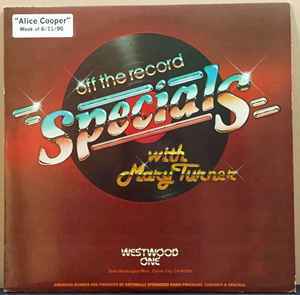 A1 Incue : Music Into "Westwood One Presents..."
A7 Outcue : "...Nordoff-Robbins Foundation." B1 Incue : "The Whole Thing..."
B5 Outcue : Westwood One Radio Ntework." C1 Incue : Music Into "Hello, This Is Alice..."
C7 Outcue : "...Nordoff-Robbins Foundation." D1 Incue : "I've Been Doing..."